TBILISI, DFWatch–The Georgian president is preparing to veto a bill to form an independent supervisory agency to oversee the banking system, because it contradicts an association agreement which Georgia signed with the EU last year. Recently, the government decided to strip the National Bank of its responsibility to supervise private banks and instead hand responsibility to a new body under the government. The president strongly opposes this. This will be seen as further encroachment on presidential powers by the prime minister, who has step by step appropriated specific powers from the president by amending laws. The government and its ‘godfather’, former PM Bidzina Ivanishvili, have criticized the National Bank and its president for not doing enough to prevent a thirty percent weakening of the national currency lari, even though the International Monetary Fund lauded the performance of NBG. In the end, the government decided to take away the supervisory mechanism from the Bank and place this function under the PM. A draft bill has been prepared which foresees creating an independent body, which will be subordinate to the PM. After the body is split from NBG it will consist of seven members selected by the parliament. Under today’s legislation, the functions of NBG is to enforce the monetary policy as well as supervising commercial banks. This issue has double importance for the president. Firstly, nowadays the head of the National Bank is selected from the members of the NBG board, while members of the board are selected by the president. On the background of a confrontation between the president and the ruling coalition, the decision by the government may be seen as directed against the NBG but against the president as well. Roman Gotsiridze, from Economic Development Center, does not rule out that this is the main reason for the bill, but points out that Georgia has tried having government supervision of private banks before – in 2008-2009 – and it didn’t turn out to be a good idea. “We have already witnessed that having such a structure under government subordination didn’t bring any results, but only problems. This body has to be independent and the government should not supervise commercial banks,” Gotsiridze told DFWatch. Another issue is the sustainability of the financial sector, as economic analysts believe that an independent body has to supervise the sector, while having the government supervise private banks may be a risky model, and Georgia has experienced this before. The supervisory body split from NBG in 2008, but only for a year. Due to risks, it merged with the NBG in 2009. Now the president’s administration adds that the initiative is in violation of the agenda of the association agreement with the EU and hinders the development of the economy. Giorgi Abashishvili, advisor to Margvelashvili in economic affairs, said that if parliament approves the draft, the president will use his veto powers. Government spokespersons assure that the initiative is not directed against the agenda of the association agreement and claim that having a supervisory agency with a head selected by parliament will result in a more transparent process. The government does not intend to scrap the draft bill even after criticism from the IMF and EBRD. 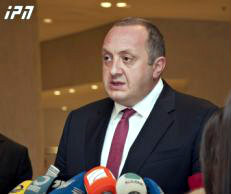 This is Margvelashvili’s third year as president and it will be the third time he vetoes a bill. The last two times was about secret surveillance, but the ruling coalition, which controlled more than two third of seats in parliament, overturned his vetoes. Now, the coalition does not plan to follow the president’s advice about NBG but seems intent on again overturning his veto.